Travel and tourism plays an important role in the United Kingdom, having a significant impact on the economy each year. In 2016 the industry made a total contribution of approximately 217 billion British pounds to GDP in the UK, with continual growth over the previous five years. Comprising of numerous subsectors, the tourism industry creates revenue in various ways, through accommodation, food and beverage services, transport, cultural attractions and other recreational activities. Travel agencies, tour operators and other reservation services alone have generated over 40 billion pounds a year since 2013. Tourists from overseas are vital to the industry. According to the UK International Passenger Survey, spending by international visitors reached around 25 billion British pounds in 2017. The number of inbound visitors in recent years has slowly been increasing, with the majority visiting for leisure purposes. Leading international markets include the United States, Germany and France. 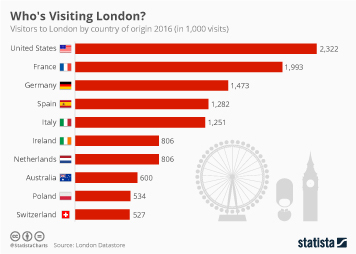 For UK residents traveling abroad, the most popular destinations include Spain, France and Italy. Although the majority of overseas trips are made for holiday and other leisure purposes, business travelers are likely to spend more than the average visitor, at over 700 British pounds per trip in 2017. Domestic travel is also a large contributor to the industry, worth over 20 billion British pounds a year in spending. Over a third of domestic trips are taken for the purpose of visiting friends and relatives, while the largest proportion of trips are for domestic holidays.